Two plastic squeeze bottles of heat and flavor have pride of place in our refrigerator door. Hot sauce, red and green, is for us a condiment that sees pretty much daily use - sometimes multiple times a day. A while back, I posted my recipe for our red, chile de arbol "Taco Shop" hot sauce. This post, however, is all about green. 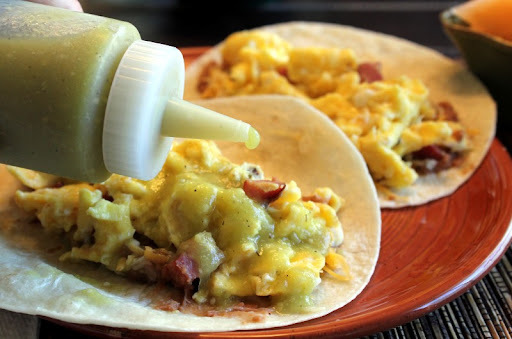 Our green hot sauce is even simpler than the red one. Just tomatillos, green chiles (usually Serranos) and garlic. I put them on a sheet pan and put them under a broiler for 5 minutes or so. 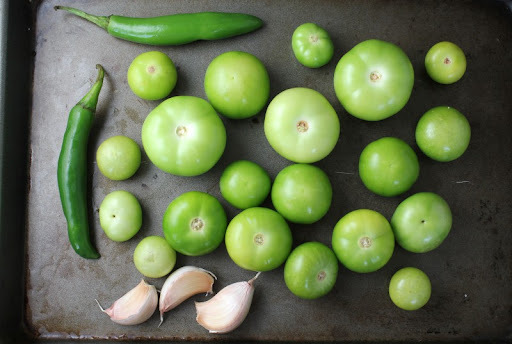 When they are done, the garlic has roasted, the tomatillos have browned and the chiles have softened and blistered. Then it is a simple matter of blitzing it all up a blender with some salt and a bit of water to loosen it. We find it convenient to keep the sauce in an 8oz squeeze bottle. It makes for efficient delivery to top your food of choice. In this case, it was breakfast tacos. Yum! Husk the tomatillos and rinse them to get rid of their stickiness. 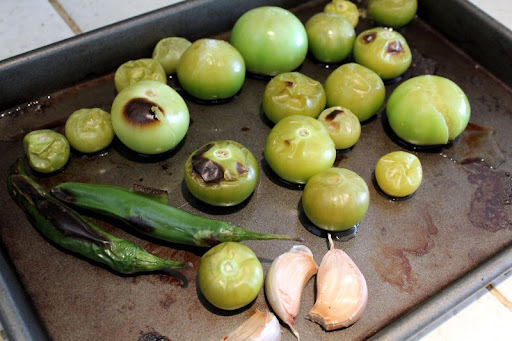 Place tomatillos, chiles and garlic on a sheet pan and put them under the broiler. Check them after 5 minutes, and then again every minute until they soften and begin to brown. After letting the pan cool, peel the garlic and take the skin off of the chiles. 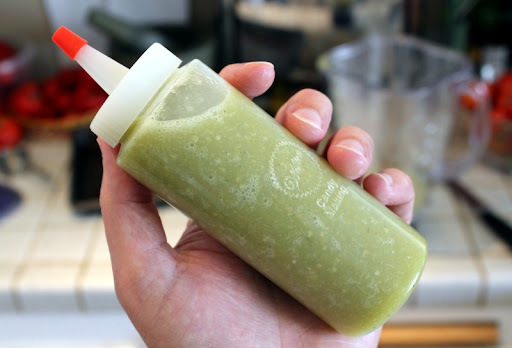 In a blender, mix everything together with the salt and water until smooth. Wow that really does look easy. And I LOVE green sauce! Hi Miles - yeah, recipes don't get much easier than this one. Perfect timing! The Mister was just asking for me to make a salsa verde to have with his eggs. I was going to use Anaheim chiles but I'm going to use your recipe and serrano chile. I have a few on my plant so it would be perfect! Hi CAB - I like to use Serranos because they seem to have more consistent heat than other green chiles. We've had trouble getting good heat lately from both homegrown and store-bought green chiles. I love and make that salsa all the time. If I may suggest the addition of cilantro. Being from the garden makes it special. Hi Chilebrown - thanks for the suggestion. I definitely think cilantro would be a nice addition - particularly if added fresh right when it was about to be used. How long will it keep in the fridge? 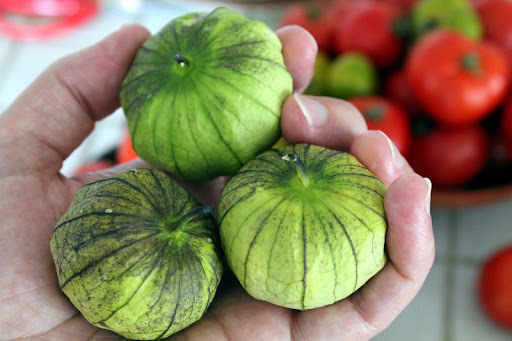 Also in australia tomatillos are hard to find could I use green tomatoes? Hi Mark - it varies, but usually at least two weeks. Definitely try using green tomatoes. It won't be the same, but I bet it will be good! very simple and easy to make. Great flavor and good on anything. found this recipe after the red taco sauce. Both are delicious. thanks for sharing these recipes. This recipe is awesome! My 2 cents: Double the garlic and add the juice of a lime. Otherwise, perfect sauce. I'm going to try roasting in the oven vs. the broiler as a variation. Thank you!